The control system of street lighting allows to switch on/off streetlights distantly, to switch them into the “low power mode” at night, also to transfer the status of each lamp to manager and so on. System use PLC technology or wireless data transmission by the radio channel. As in any other complicated technical system it includes the units that make the main, so-called “useful work”, and units that provide some additional functions that requires heavy expenses. But is it always necessary? For investor who performs the modernization of city’s street lighting by the energy service contract is not profitable to “overpay” two or three times for additional functions. The business advantageous of such project is much less. And what had to do the small settlements or enterprises where the number of fixtures illuminating the surrounding area is 10-50 pieces? They will never be able to purchase a system supervisory control exterior lighting. Just for these consumers we offer a “workhorse” that performs the main gainful job - switches the lights at night in “low power mode” under the scheme 100-50-100% or 100-75-50-75-100% of the nominal power . Turn on and off the line of the street lighting at the side of 380 / 220V is able any automatic system - from simple photo relay to advanced centralized management for GPRS-modems. The base of the dimmer is quite powerful “self-learning” microcontroller that fixes the daily ON\OFF time and calculates so-called “settlement midnight”, which is used further as the start\finish period for the dimming. For example, if we take the annual schedule of outdoor lighting of Moscow city, identify the lighting period for the 1st day of each month and divide it by 2, we’ll get “settlement midnight”, which will be around 1:30 AM for Moscow. And this figure is true for every month during the year +/- 10 minutes! 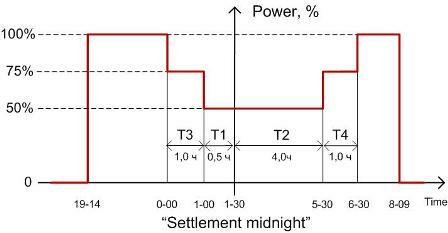 When “settlement midnight” is already detected, you just need to program the dimmer to reduce the power before (T1, T3) and after (T2, T4) this mark using the DIP-switches. So now you don’t need to use complicated and not always reliable methods for transmitting control commands from the supervisor to the control box and from the control box to the lamps via the power circuit or radio channel! After analyzing real time of lighting for the last three days, the dimmer will provide timely switching to night energy-safe value and back by itself. Dimmers ignore in the calculation the long-term (more than 18 hours) and short (less than 4 hours) switching-on intervals that may occur during the inspection or repair works of lighting lines, as well as the failure of control box. We can set any other values of power levels for LED lamps with 1-10 V control input individually, for example, 100/60/40. Dimmers operate in the temperature range from – 40oC to + 85oC. Supply voltage - 230VAC. Own consumption - 0,2W. Up to 50 pieces of light fixtures can be connected to the output 1-10V K2304 dimmer. Dimmers can be combined with motion sensors. When a 220VAC signal is applied to the input of MD (Motion Detector) dimmer switches the lamp from low to full power mode. 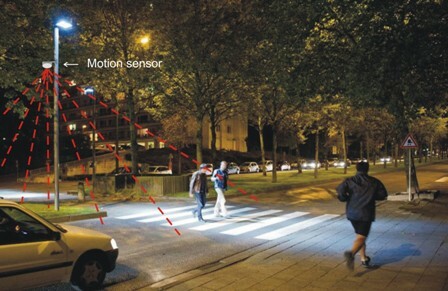 This option can be used, for example, for lighting the crossroads, factories’ territories, warehouses, and other areas where the night staff or vehicles are rare. You can use the traffic light activation button instead of motion detector: when a person is going to cross the road he presses the activation button for the green light and thus gives the command to the lighting system to increase the lighting to maximum.